I’ve been writing a few Thank You notes this past week: thanks for the loan of a book, thanks for inviting me to a workshop and thanks for inviting us to dinner. 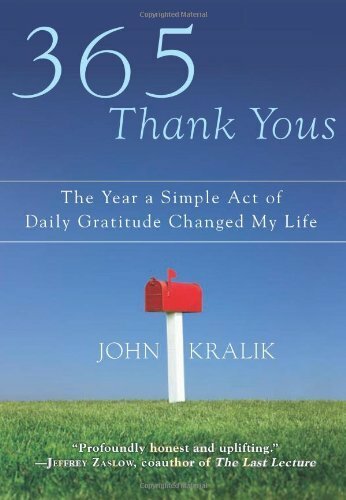 No, I haven’t been reading a 19th Century book on Etiquette and Yes, I’ve been reading a 2010 memoir by an ordinary guy in the USA, John Kralik, who identified the simple act of writing thank you notes, changed his life dramatically and positively to then lead an extraordinary life of happiness. It’s a beautiful account of someone who found the goodness in others, albeit difficult at times, and chose to develop the act of thanking them by writing and sending a hand written note - every day. Through hardship, tough economic times, relationship break downs, John continued his project to write 365 thank you notes. QUESTION: When was the last time you wrote a note of thanks? Not typed, not an email or via Social Media but on paper, using a pen and placing a stamp on the envelope and posting it? 1. Being present and in the moment you experience every moment - the gestures of others, their genuine kindness, thoughtfulness in words and generosity of people’s time. 2. Being a positive role model to others by demonstrating the act of writing and thanking says all the right things to others; potentially influencing others to do the same positive actin of writing. 3. We should think about others in addition to ourselves– in the world of “me”, it’s easy to have self-doubt and lack self-confidence, rather, focusing on others allows us to switch our mindsets and be more proactive and pay it forward with a thank you. 4. Generate the right positive neuron pathways by being creative with words; by writing and feeling happy generates a different set of brain neurons which makes us feel good rather than feel fear. 5. Show your customers that you appreciate their business by surprising and advising your customers with a note which appreciates their business is one way to maintain the relationship – it lets them know that they are ‘top of mind’. 6. That manners matter and it is good manners to say “thank you” and its extra special when you take the time to say it in ink, in a thank you note delivered in the post. 7. That the Pen is mightier than the sword which in this context means that by the time you write down your acceptance of feedback in a note, you have probably calmed down rather than attacking verbally or with your typing fingers, only to regret later! I’m sure Officeworks, Stationery stores, printing stores and Australia Post would appreciate your business if you chose to write Thank You notes. More people to benefit for this lovely gesture. I would highly recommend that you purchase this book, you'll find a link below or borrow it and travel the journey of sadness to happiness – it’s a page turner.